Tucked next to Hamilton Airport is a new building filled with helicopters. The Heliport is home to Helicorp, a helicopter transport and management business that has been humming away quietly for the past 15 years out of an old, yellow hanger on the far side of the airfield. In 2014 owner and director Brent Glover decided it was time to ramp things up. Helicorp are delighted to launch their new range of scenic flight packages which incorporate luxury travel and unique New Zealand destinations. Central North Island has a wide range of activities and attractions to suit all ages and tastes. We have worked with selected regional operators to develop an exciting range of scenic flights based around a number of exciting New Zealand experiences. Full details and booking forms for the packages can be found here. The recently-completed Hamilton Heliport is the base of Hamilton company Helicorp, run by local businessman Brent Glover. “The showcase evening was a great way to show off our fantastic new hangar facility. The team at Coresteel Buildings Waikato really excelled in helping us to realise the vision of a hangar that is both practical and stylish in its design,” says Brent. Coresteel’s building system allowed Brent and his team to customise the 1152sqm building to their exact specifications inside and out, to include two 18 metre-wide bi-fold hangar doors and two levels of modern offices. Joint director of Coresteel Waikato, Gary White, says it was Coresteel’s Bracketless Portal System that proved a real deal maker when bidding for the Heliport tender. “With no supporting brackets or braces, the Bracketless Portal System is ideal for hangars, as it allows for the best utilisation of the floor and ceiling space – a vital element when storing aircraft,” says Gary. During the Heliport project Coresteel managed the process from start to finish with their in-house design, engineering, manufacturing and construction teams. This included working closely with Bunnings Warehouse Te Awamutu for the internal fit-out. “This process meant we could guarantee a shorter timeline, while maintaining a cost-effective price for the project,” says Gary. 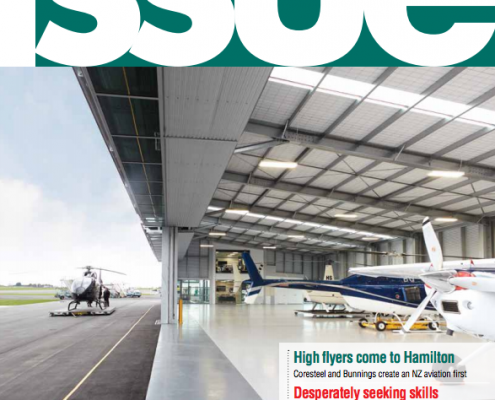 The Coresteel Buildings Waikato franchise was awarded Best Bespoke Building for the Hamilton Heliport project earlier this year, alongside awards for Franchise of the Year and Highest Sales Volume. The Te Awamutu-based team comprising of Gary White, Trina White and John Morrow launched into the market in 2008 and have since grown to employ 22 full time staff. It’s been a busy year for Hamilton based charter helicopter company Helicorp who have moved into the Waikato’s first purpose-built commercial heliport, and have recently appointed a new Marketing Manager. The new Heliport is situated adjacent to Hamilton Airport terminal and provides aircraft hangars, a client lounge, headquarters for Helicorp, and a training room for partner company Helitrain who provide helicopter pilot training. Having worked in marketing and communications roles in the UK and New Zealand, Vicki brings a huge amount of experience to Helicorp. Most recently she has worked on communications for NZ Transport Agency, and communications / media for Fieldays and Mystery Creek Events Centre. Vicki is already busy redeveloping the Helicorp website, working with clients looking for venue hire at the new Heliport, and speaking with other unique venues and activity providers in the region to build a VIP range of itinerary options for helicopter charter flights. Coresteel Waikato received the Best Bespoke Building award for the project at the annual Coresteel Buildings national conference. “The Coresteel system allowed the owners to realise their vision of a hangar that was both practical and stylish in its design. The result was a custom-built hangar which includes two 18 metre wide bi-fold hangar doors and two levels of modern smart looking offices,” says Trina White, joint director, Coresteel Buildings Waikato. Read the online version of Bunnings Trade magazine – September issue. View the building listing on the Coresteel website.